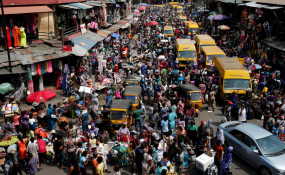 Nigeria faces a crippling population boom. The chairman, National Population Commission (NPC) Eze Duruiheoma, SAN has says family planning and birth spacing is the right step to population management. Duruiheoma stated this at the news conference for the commemoration of the 2018 world population day, with the theme: " Family Planing As A Human Right" in Abuja. He said, "Family Planning and Births Spacing is the first and the right step to population management, central to saving the lives of women and adolescent girls, enhances women's empowerment, key to poverty reduction." He added that the access to contraception, education and the means to determine the number and spacing of children and right to decide freely the number and spacing of children without any coercion or compulsion and discrimination. He noted that the population of Nigeria's has increased significantly, from 56 million in 1952 to 88.9 million in 1991, reached 140 million in 2006 and with an annual growth rate of 3.2 percent (derived at 2006 Population & Housing Census), currently is estimated at over 198 million. "The population will reach 264 million by 2030 and by 2050 will become the 3rd most populous nation in the world at 410 million the current growth rate persists will in 2100 reach 794 million," he said. In his remark, the director general of the commission, Dr Ghaji Bello, urged the federal government to look into population issues for better planning and development in the country. He said that the commission would work with key stakeholders and partners on better ways of managing population explosion in Nigeria.